Nothing. 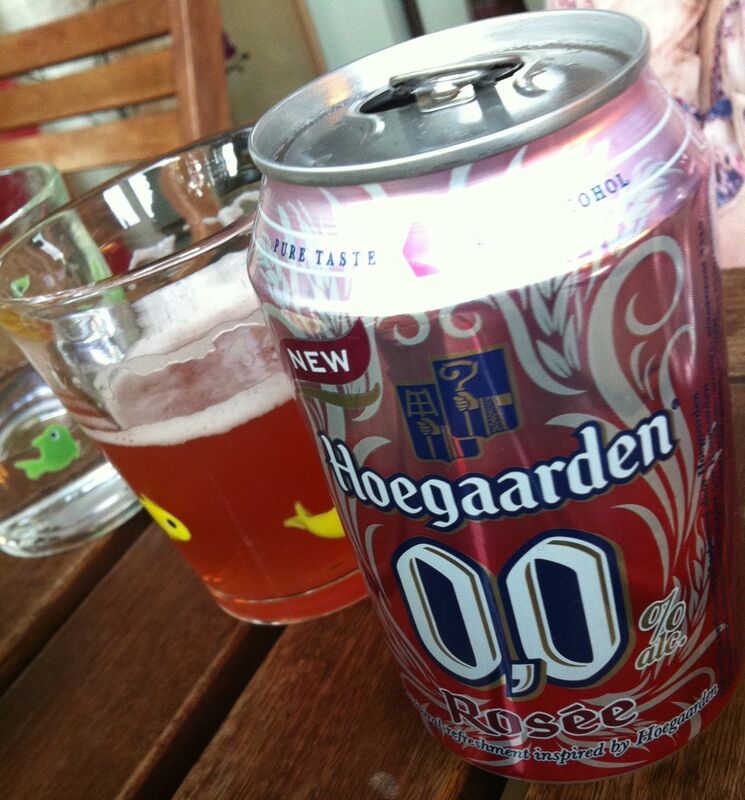 That’s what Hoegaarden Rosée 0.0% promises. And that’s what it delivers. It’s not a product I would normally buy, let alone drink, but a can came free with one of our online shopping orders, so it sat around for a bit until the right occasion. That moment came when our friends Alison and Gareth dropped over for the weekend, and we sat on the terrace sun-trap on the hottest day of the year so far. We were all parched after a walk around town to check out the Jazz Marathon, but while the rest of us were spoiled for choice of beers, there was nothing for pregnant Alison. So, we offered Alison nothing. 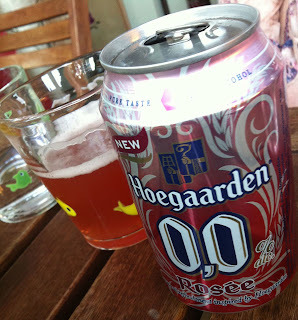 Or Hoegaarden Rosée 0.0% as it were. It’s supposed to be a non-alcoholic wheat beer with raspberry essence, but it really falls into the non-beer category, I think. Anyway, it was safe for the bump. Most Belgian beer labels are very clear about the inappropriateness of their alcohol-laden products for the gravid among us. It takes a moment to decipher the symbol, however -- we initially thought it suggested that beer was not suitable for people with back problems and beer bellies. But no: it means that pregnant women shouldn’t drink beer. Who knew? And the verdict on Hoegaarden Rosée 0.0% by Alison, now drinking for two? I've not even tried the alcohol version of Rose, whats that like? About what we'd guess, I imagine... Haven't tried it either though.